STRP, a recent microcap spinoff from IDT Corporation, is one of the most misunderstood securities I have ever seen, and a fantastic risk/reward at current levels. Even using $30 mm (the rejected sale price in 2010) for the spectrum and $12 mm for the value of the patents (the price Howard Jonas was awarded shares in his own company), one reaches a value of $42 million for the EV, indicating the company is approximately fairly valued. I believe that these bearish assumptions will prove quite conservative, and that given the upside in the patents and the spectrum, STRP is truly a “heads I make up to 5X my money, tails I breakeven.” I conservatively value shares at $9.58, 78% upside from the last sale price of $5.38. Microcap Spinoff: STRP is a microcap spinoff. Many IDT investors and indexes are not allowed to hold STRP and have not thoroughly analyzed the company’s prospects. Investors failing to properly understand risk/reward: Some investors have considered this a lottery ticket, but in reality, even if STRP is unable to roll-out their spectrum nation-wide, it has significant value even in a piecemeal sale. Furthermore, I believe the company’s greatest source of downside protection is actually in the patents. STRP’s business has two separate segments. First, it owns 100% of Straight Path Spectrum, which owns, licenses, and leases the largest U.S. portfolio of FCC licenses for 39 GHz wireless spectrum covering greater than 90% of the country. In addition, it owns an 84.5% stake in Straight Path IP Group, which holds a portfolio of patents primarily related to communications over the Internet. I will cover the patents first and describe why I think they provide substantial downside protection for the stock before then moving on to address the somewhat more complicated spectrum story. The IP Group has the goal of licensing its patents to other companies and suing companies who currently infringe on its patents. In 2010, the IP Group successfully settled a patent infringement case with EBay and Skype on undisclosed terms. In 2012, it successfully settled with Stalker Software, ooVoo, and Vivox for patent infringement. More recently, it has ramped up its patent protection efforts and has partnered with legal powerhouses Kirkland and Ellis and Mintz Levin on a contingency basis (with a maximum payment to them of 40% of proceeds depending on timing). On August 1st, the IP Group filed complaints against Panasonic, Toshiba, Sharp, Sony, LG, and the telecom providers Bandwith.com, Telesphere, and Vocalocity. Lastly, on August 26th, the Group filed patent infringement cases against Blackberry, Huawei, Samsung, and ZTE. Many value investors skip over the patents or give them little attention because they are not patent experts, but this is a huge error because they provide the most downside protection. Skype settlement provides key precedent and further legitimacy to patents: The patent claims have already been thoroughly examined and upheld in trial with Skype/Ebay. IDT was not represented on a contingency basis at that point and Skype was very aggressive in trial, but IDT was able to reach a Skype settlement, giving STRP more legitimacy and leverage in the patent process. The spinoff created a strong corporate structure for patent litigation: Companies that are sued for patent infringement can either 1) challenge the legitimacy of the patent claims or 2) buy other patents and sue the operating company in an attempt to gain negotiation leverage. Skype did both with IDT. With virtually no operating business, STRP cannot realistically be counter-sued, putting it in a much stronger position to sue companies than before. Furthermore, the company filed lawsuits the same day it completed the spinoff, indicating that the company was “ready to go” and also that there was a sense of urgency (likely encouraged by K&E) to get started on the litigation. Top law firms in the country want to litigate on a contingency basis: The fact that Kirkland & Ellis, one of the top law firms in the country, is willing to litigate on a contingency basis implies a much larger value for the patents than the market is ascribing to them. How much are these patents worth? While it is difficult to be precise, I think the easiest way to ballpark is to figure out how much Kirkland & Ellis has to think they are worth in order for them to litigate on a pure contingency basis. Top law firms such as Kirkland & Ellis have their pick of cases to litigate on a contingency basis. Top firms also typically turn down over 90% of contingency cases, and the ones they do agree to typically have expected settlements in the $25-$100 million range according to the following source: http://bit.ly/1afUWeJ. After speaking with management and lawyers, I got the sense that K&E was likely seeking something at least in the higher end of that $25-$100 million range and likely more. It also sounded like most of the top law firms wanted this case and that management interviewed all the top law firms and ended up deciding on K&E. Using $25 million as the low case, $100 as the base, and $175 as the high case, the overall value to STRP shareholders is in the $12.7-$88.7 million range. My base case of $50.7 million is more than the entire enterprise value of the company, meaning you get the spectrum assets for free. It should also be noted that Howard Jonas’ 2012 compensation in the patent-holding entity valued the entire entity at $12 million (10% for $1.2 million). This is sort of a sanity check on the low case, but I do not think it is indicative of value given that he was taking compensation in a company he controlled well before all of these lawsuits were filed and before the strategic spinoff. Understanding the Spectrum business requires first a general understanding of how mobile devices connect to the Internet and how STRP fits into this evolving process. The amount of data being transmitted by mobile phones has exploded in recent years, largely due to the rise in the usage of smartphones. As demand for data usage continues to grow, Internet providers will encounter the problem of figuring out how to augment their service capabilities. I believe that STRP could be in a key position to solve part of this problem and profit off of this profound data growth. The explosion of mobile cell phone usage has brought with it a need to update mobile infrastructure. The familiar macro cell towers, pictured below, cannot keep pace with demand. As a result, many mobile carriers and infrastructure providers are exploring the use of small cells (pictured below). Small cells provide the same functionality as large cellular towers. However, they are optimally suited to serve a smaller population contained within a smaller radius. Previously, in order to provide cellular service to a modestly sized population, it made sense to build fewer large cellular towers as opposed to multiple small cells, as it was more expensive to install several small cells in a given area rather than build a much smaller number of macro cells. Today, the mobile data industry’s economies of scale are shifting towards the increased use of small cells. This will be a boom for industries involved in the installation and maintenance of small cells. STRP’s Spectrum is in an especially beneficial position to benefit from the explosion of small cell growth due to its holdings in important frequency domains: more on this will be explained later on. Wireless Internet can be provided in two primary ways on mobile phones. First, let’s go over Wi-Fi. Many homes have Wi-Fi adapters/routers. Some cities, such as Arlington, Virginia, are installing universal Wi-Fi adapters such that anyone can access Wi-Fi throughout the city. When you are accessing Wi-Fi in your home or in a city with universal Wi-Fi, you make use of bandwidth to connect to the Internet. This bandwidth is provided by the Wi-Fi router/adapter, and there is only a fixed amount of bandwidth available per Wi-Fi adapter/router. For these reasons, retrieving data from the Internet on a public Wi-Fi network (i.e. a network provided by a city or at Starbucks) will take longer than retrieving data from a private network (i.e. a network centered on a Wi-Fi router in one’s home). Mobile phones can also access the Internet via 4G technologies. One can think of 4G as a set of standards, which describes the technologies that must be possessed by phones with the 4G designation. In this report, the actual technologies behind 4G will be treated as a black box. The most important aspects of 4G technologies are that mobile phones transmit data to and from the Internet wirelessly and that cellular towers act as the middlemen between 4G mobile phones and the Internet. Historically, these cellular towers have been the enormous, obelisk type structures characterized by flashing red and white light, but they are not the only type of middlemen in the 4G Internet network. In fact, cellular towers, which are sometimes referred to as large cells or big cells, have younger cousins which can often be much more versatile and nimble. These cousins are known as small cells, and they could revolutionize mobile communication and data transmission to and from the Internet. A small cell provides the same functionality as a large tower. The main difference is that small cells are, by definition, smaller, which allows them to be placed in locations traditionally not suited for cellular towers, such as behind lampposts or traffic lights. This enables small cells to be placed directly in 4G trouble spots – areas where geography or architecture blocks some 4G signals – as well as areas where too many people connect to the internet at the same time, leading to lower bandwidth, slower download speeds, and dropped calls. For instance, small cells can be placed in sports stadiums, busy subway hubs, or an intersection in a city. AT&T, Sprint, Verizon, and T Mobile have all begun or plan to begin testing and implementing small cells, and small cell demand seems poised to take off. It might seem as if small cells are a panacea to mobile communication, but there are still lingering problems. The most major problem is linking the data sent to and from the small cell to a wider network. That wider network could refer to the Internet, and it could also refer to a big cell tower (for the purposes of mobile specific communications such as sms or phone calls). The process of linking the data sent to and from the small cell (sometimes referred to as the small cell network) to a wider network is termed backhaul. One of the reasons why backhaul has been so difficult with small cells is that small cells are often located in hard-to-reach areas. Furthermore, backhaul has generally been implemented using physical cables and/or fiber optics. These are costly to install and are impractical to place in sparsely populated areas or around traffic lights or stop signs (for a better visualization of backhaul, see appendix A). STRP’s spectrum business attempts to save the day with backhaul. Backhaul can be implemented wirelessly through communication similar to radio waves. These radio waves must be broadcasted at frequencies within the range of 40-60 GHz. The amount of frequencies in this range is fixed and regulated by the FCC; companies must obtain a license in order to broadcast frequencies within this range. STRP holds many of the best licenses within this range (about ⅓ of all “39 GHz” – a label for the range of 38.8 to 40 GHz – licenses, the most of any one entity in the U.S.). These “39” GHz frequencies are the most attractive in the 40 – 60 range because they offer a balance of strong bandwidth with wide broadcasting range (the higher the frequency the stronger the bandwidth but the lower the range). Moreover, STRP’s 39 GHz licenses have great coverage of the largest U.S. metropolitan areas. Hence, mobile telecommunications companies and Internet Service Providers (ISPs) will likely be very interested in purchasing from STRP the rights to broadcast backhaul at the frequencies for which STRP holds licenses. Given that the amount of small cells is likely set to explode and that STRP essentially controls the frequency usage for the wireless backhaul bottleneck for small cell usage, they are ideally positioned to profit from this boom. Small cells have to this day been costly to implement and maintain since many small cells must be installed and maintained in order to provide the same functionality for a given geographic area as a big cell tower. However, costs are quickly lowering, and given the advantages of wireless backhaul, it is likely that costs will lower even further, paving the way for a boom in small cell usage. STRP’s Spectrum business will be a major player in small cell communications, and given that its costs will remain low since it is an intangible assets company, the Spectrum business could profit tremendously. The best-case scenario for STRP (and management’s current plan) is for them to partner with one of the major telecom operators for a nation-wide rollout of their spectrum. STRP would license their entire spectrum to the telecom operator at a discount to current licensing prices, and STRP would pay out a majority of the licensing proceeds out to shareholders through dividends. In trying to value STRP, we realized just how many misunderstandings there are in the market about the pace of small cell deployment. For example, the company’s investor presentation cites Small Cell Forum data saying there will be 3.5 million small cells in the U.S. by 2015. This leads the investor to think that STRP’s potential market will be 3.5 million cells. However, after speaking with several members of the small cell forum (including the Chairman), we discovered that the 3.5 million figure included femto cells, which are used for more residential use and are unlikely to use STRP’s spectrum. Therefore, the more relevant estimate for STRP’s relevant market is a fraction of the 3.5 million—only 5-15%. Percentage of small cells in the U.S.
39 GHz offers a great balance of bandwidth (signal strength) and range. For instance, it offers more bandwidth than the Non Line of Sight frequencies, and it offers more range than the 60+ GHz frequencies (it is also cheaper than the latter). Also, because 39 GHz is licensed, the signals will not interfere with other radio signals, so there should not be many FCC roadblocks to implementing small cells on this frequency. Lastly, 39 GHz is a great range for both point to point and point to multipoint backhaul, so it is versatile. Of these non-femto, wireless U.S. small cells backhauled over the 39 GHz frequency, we think that STRP can get at least a 25% market share. They currently ~1/3 of the licenses for this frequency, but we think that their market share could be higher (so these estimates should prove to be conservative). This is because STRP has the competitive advantage of being the only company able to offer nationwide backhaul on the 39 GHz frequency. In fact, the STRP Spectrum covers about 99% of the United States. (http://wireless.fcc.gov/services/index.htm?job=service_home&id=39ghz). Furthermore, we assume one link/small cell in all scenarios. These assumptions would lead to STRP providing 229,500 links in the bull case, and 55,910 links in the base case. This is a wide range (given all of the uncertainty about timing of roll-outs and many important assumptions), but they seem realistic. For example, AT&T plans to implement 40,000 small cells by 2015, and calls this a “trial.” Certainly if AT&T or another major player went nationwide with STRP, then there could be hundreds of thousands of small cells for STRP to backhaul. Revenue per link is currently about $350, but the price could decrease considerably if a carrier makes a nationwide deal. These assumptions would result in $8.4 million in 2016 revenue in the base case and $46 million in revenue in the bull case. This would be extremely high-margin (~85% EBIT margins) and minimal capex. Even if we ignore their tax credits and apply a normal 35% tax rate, this would result in $4.3-$25.3 million in net income to STRP each year. Even assigning an S&P-like multiple of 15X to this future income and discounting this back at 15% results in a NPV of the spectrum of $43-$250 million. This also ignores cash flows before 2016, which will be ramping up quickly. Obviously, that would be a jackpot for investors, but this is not the only important consideration. Even if STRP fails to reach a deal for a national roll-out with a telecom operator, they could still sell them their spectrum licenses in particular markets. For example, in 2012, Metro PCS bought four 39 GHZ licensees and four 28 GHZ licensees for $6.8 million, or $850K/license. From speaking with management, I got the sense that the sale included licensees that were in good markets, but not necessarily “top tier” markets. Below, I have valued the licensees in two ways. 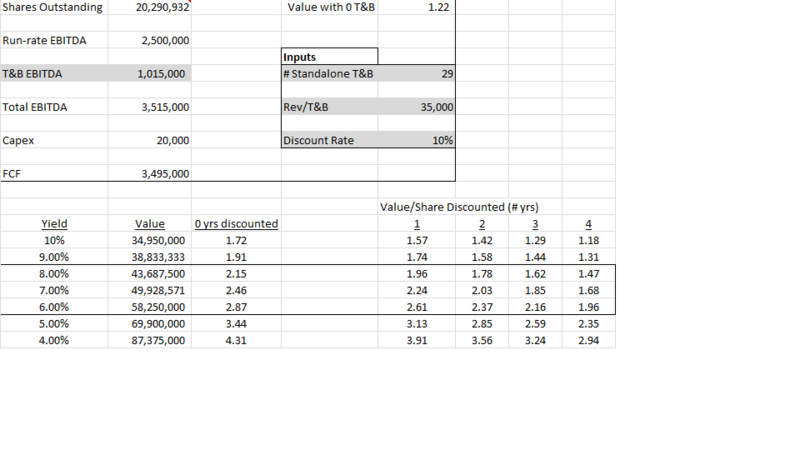 The first is a Price/MHZ Pop method, which I believe is a more accurate way to measure value. The second below it is a simple price/license method, which is not quite as accurate in my opinion, but a bit more intuitive and similar results. Therefore, in my base case, the two methods suggest that the spectrum on an asset sale perspective is worth somewhere between $30 mm and $105 mm. Note that this is only using a fraction of their total licensees (only top markets). Furthermore, management rejected an offer in 2010 for their entire spectrum for $30 mm. This seems like a reasonable bear case because no investment banks were hired to market the spectrum, and it did not seem like a value-maximizing, formal sale offer process. Furthermore, using the MHZ*Pop valuation method, one has to take some drastic assumptions to get to $30 million value: in the bear case, if you take only 30% of the 2012 sale and only include their top 10 markets, you reach a value of $30 million. That seems like an appropriate margin of safety. Jonas family control is lessened by trust structures. While their incentives seem to be aligned, that does not mean they will not somehow attempt to take advantage of minority shareholders. That being said, Howard Jonas has driven tremendous value in IDT. If the patents are somehow invalidated and Kirkland & Ellis was wrong about the potential value, then the patents would not provide the downside protection that I am counting on in this investment. While this is conceivable, I think that K&E is more properly valuing the patents when they decided to take the case on a contingency basis than most of the investors I have spoken to who have simply ignored the stock because they are not IP experts. Small cell wireless backhaul over 39 GHZ does not take off as planned. There are several competing technologies (fiber, other frequencies, etc.). However, I think that the demand for backhaul is so great that there will likely be many solutions that are used to solve the nation’s data problem. I expect STRP’s frequency to play a role in part of that. To the extent I am wrong, there could be downside in the stock. One other final note on risks is that even though it is conceivable that K&E is wrong and the patents are worthless and that 39 GHZ ends up not being used for wireless backhaul, both of these bets are independent of each other and themselves are not binary. Like I mentioned for the spectrum, there is likely substantial value even in a piecemeal sale. With the patents, there are multiple lawsuits over many firms, and settlements are the most likely outcome. Therefore, I think some investors are failing to understand the actual risk in this investment because they view it as a lottery ticket on the spectrum assets, rather than two different bets on uncorrelated intangible assets with a wide range of outcomes, and the “smartest people in the room” (Howard Jonas, K&E) indicating great upside in the stock. It is difficult to put a precise estimate on the value of STRP’s intangible assets, but it is not difficult to see that it is a great risk reward at the current price. Even taking the $30 million rejected sale for the spectrum in 2010 and $12 million for the IP, the enterprise value is nearly fully covered at today’s price. This type of downside protection is extremely rare for a company with multi-bagger potential. I believe that betting alongside Kirkland & Ellis and Howard Jonas on the patents will prove to be a shrewd move, and that the patents likely cover the entire enterprise value. Furthermore, the spectrum is an extremely valuable call option that is NOT a binary bet, since even in a worst-case scenario, STRP could sell off some of the spectrum piecemeal. I believe fair value is around $9.58 range, which represents 79% upside from current prices, but there is substantially more upside in very reasonable scenarios making this a fantastic risk/reward from the current price.